The DEA headquarters is housed in suburban Virginia. So is the Pentagon. So would it be that outlandish to move the legendary, but outdated FBI headquarters on Pennsylvania Avenue, just down the street from the Capitol, to suburban Maryland? Maryland officials apparently think it’s not unreasonable. In fact, they think it’s a great idea to move thousands of bureau jobs out their way. The Baltimore Sun reports that Maryland officials are working behind the scenes to try and make that happen in Prince George’s County, a suburban county just outside D.C.
“I’m very bullish on this being located in Maryland,” said Sen. Ben Cardin (D-Md. ), according to the Sun. “Maryland is well-situated. 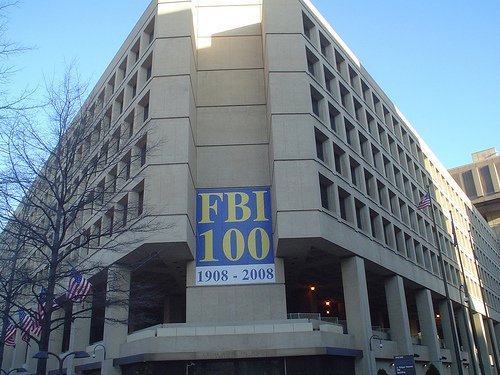 The FBI has outgrown the 37-year-old J. Edgar Hoover Building, that is crumbling and far too small to hold all the employees it needs to accommodate. The Sun reports that the workforce is scattered over 22 annex buildings in the Washington area. A more pressing problem, agency officials have said, is that the FBI’s burgeoning workforce is scattered over 22 annex buildings throughout the Washington region. The Sun reported that a new complex would not be completed until at least 2020. Posted: 12/20/11 at 7:17 AM under FBI, News Story.